If you are a regular visitor to Hancock's House of Happy you will know that the lady of the house is a sucker for a good pun. 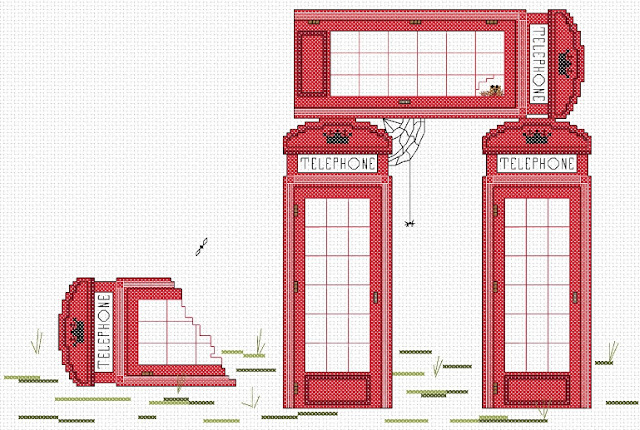 Phonehenge combines the iconic red British phone box with a distinctly Druidic arrangement. The now defunct temple of telecommunications is reclaimed by the creatures of the British countryside. You don't need to stitch the whole thing. One of the phone boxes on its own would make a cute gift for any Anglophile friend. I was inspired to make this chart some time ago. While on a train in going through the country we passed a British phone box graveyard. Hundreds of the things rotting and rusting into cel phone induced obscurity. You can get this chart at Craftsy for absolutely FREE. Just click on this link. The DMC colour key is included in the chart but you can use what ever you have on hand. I would suggest using your favourite colours but if your favourite colour isn't red I am not sure it would look right! Try it and see!